OILY WASTE CANS, Yellow, Cap. (gals. ): 14, Size O.D. 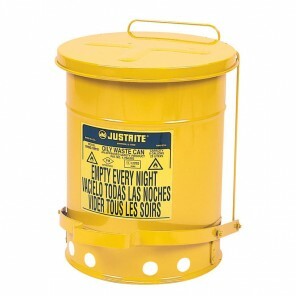 x H.: 16-1/16 x 20-1/4"
OILY WASTE CANS, Yellow, Cap. (gals. ): 10, Size O.D. x H.: 13-15/16 x 18-1/4"
OILY WASTE CANS, Yellow, Cap. (gals. ): 6, Size O.D. x H.: 11-7/8 x 15-7/8"
OILY WASTE CANS, Yellow, Cap. (gals. ): 2, Size O.D. 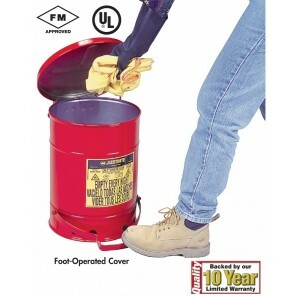 x H.: 9-5/8 x 9-1/8"
OILY WASTE CANS, Red, Cap. (gals. ): 21, Size O.D. x H.: 18-3/8 x 23-7/16"
OILY WASTE CANS, Red, Cap. (gals. ): 14, Size O.D. x H.: 16-1/16 x 20-1/4"
OILY WASTE CANS, Red, Cap. (gals. ): 10, Size O.D. x H.: 13-15/16 x 18-1/4"
OILY WASTE CANS, Siver, Cap. (gals. ): 6, Size O.D. x H.: 11-7/8 x 15-7/8"
OILY WASTE CANS, Red, Cap. (gals. ): 6, Size O.D. x H.: 11-7/8 x 15-7/8"
OILY WASTE CANS, Red, Cap. (gals. ): 2, Size O.D. x H.: 9-5/8 x 9-1/8"
OILY WASTE CANS, Yellow, Cap. (gals. ): 21, Size O.D. x H.: 18-3/8 x 23-7/16"